Frontier Yard, Buffalo, December 3, 1988. It was 30 years ago today that I exposed this Kodachrome 25 slide at the east-end of Buffalo’s Frontier Yard. In this view, there are two westward freights on the former New York Central Water Level Route. I was fond of Conrail’s six-motor General Electric diesels, and C36-7 6620 caught my eye. 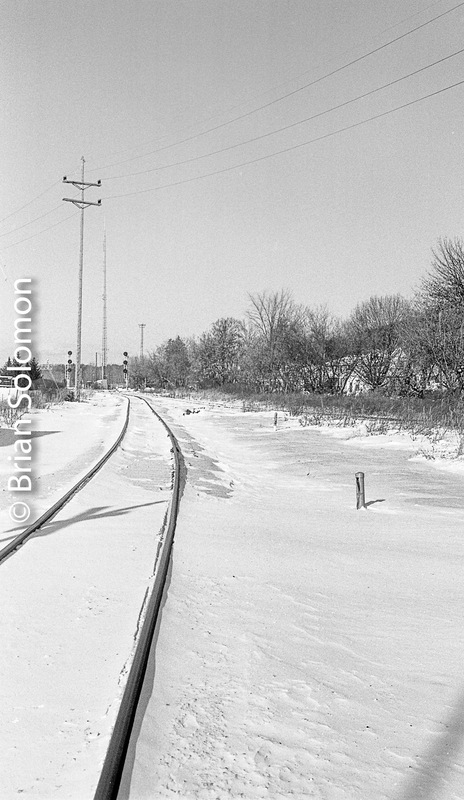 Looking east on the former New York Central on December 3, 1988. Kodachrome 25 slide exposed at f4.5 1/250th of a second. My notes from the day have gone missing, which is unusual and annoying, because I’ve generally made a habit of keeping detailed note from each trip over the years. However, I recall that I was traveling with Doug Eisele and Pete Swanson and that we made a tour of Buffalo area freight operations. I exposed this view using my Leica M2 with a 90mm Elmarit. The day began bright and clear, but by midday clouds had rolled in from Lake Erie. Tracking the Light Posts Every Day, sometime twice! Classic Chrome: On this Day in 1988 I had 2020 Vision. Ok, make that a vision of Conrail 2020. 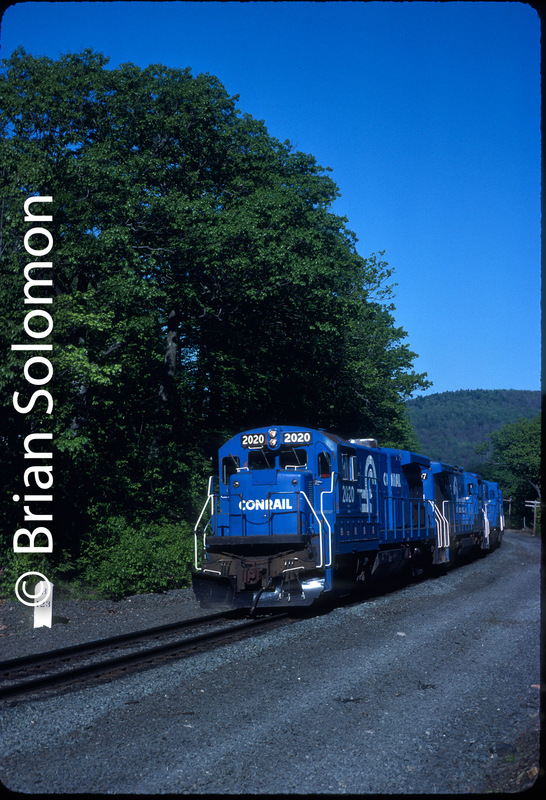 It was just after 8am on May 27, 1988, when I exposed this portrait (vertical) view of Conrail BAL013 stopped at CP123 east of Chester, Massachusetts. This is a Kodachrome 25 slide (using the professional PKM emulsion) exposed using a Leica M2 with 50mm Summicron lens. I scanned the original Kodachrome slide with a Nikon Coolscan5000 scanner using VueScan. Later I scaled the file using Lightroom. I did not alter color balance, contrast, sharpness or other inherent characteristics. The original image has an overall cyan (blue-green) bias that was characteristic of Kodachrome from that period. I calculated my exposure using a Sekonic Studio Deluxe light meter, and set the camera at f6.3 (half way between the marks for f5.6 and f8) at 1/125thof a second. This was equivalent to my standard exposure for ‘full sun’. I learned when I moved west that ‘full sun’ is brighter in the Western states than in New England. A bright day in the Nevada desert is a full stop difference than in the Berkshires of Massachusetts. Back in August (2017), I exposed this view of the old Great Northern Railways (Ireland) viaduct at Dromore, County Down using a Leica 3A with a screw mount 35mm Nikkor lens. My film choice was Kodak Tri-X. Working with this in Dublin, I processed it in Ilford ID11 mixed 1:1 with water. The negatives were scanned with an Epson Perfection V500 flatbed scanner, then adjusted for contrast using Lightroom and exported as a scaled JPG file. Honer Travers brought me to the old bridge in her Volkswagen Polo. It has been many years since the rails were lifted on this old bridge. I don’t recall the first time I visited the old Rutland Station at Chester. It was in the Steamtown-era and lost in the fog of my earliest memories. I do recall watching Canadian Pacific steam locomotives run around the excursion train here in the days before I regularly made photos. Yes, there was a time when I didn’t always carry a camera. Those days ended on my tenth birthday when Pop gave me my own Leica IIIa. That camera rests on the shelf waiting to be repaired. In recent years I’ve been playing with identical IIIa bodies of the same period (late 1930s). Here are a few views of Chester exposed with various cameras on June 7, 2017. The details are in the captions. Any favorites? Lumix LX7 view in the morning at Chester. Leica IIIa with 35mm Nikkor lens on Fomapan 100. Leica IIIa with 35mm Nikkor lens on Fomapan 100. Afternoon view with VRS 263 in the distance. Vermont Rail System freight 264 heading north (west) toward Rutland approaches Chester. Exposed using a FujiFilm XT1 digital camera with 18-135mm zoom lens. Sorry, not the N&W J. The other day when photographer Mike Gardner and I were in hot pursuit of New England Central freight 611, and we saw this scene unfolding as we approached the Vermont-Massachusetts state line. The locomotives were catching the light against a dramatic sky in a wide-open landscape. Wonderful, but we were sorely out of position. This 112-car freight had been making better progress than I anticipated. Rather than bemoan the loss of a cosmic shot, I rolled down window and popped off a few frames with my old Leica IIIA. Running and gunning old school: multitasking, I guessed the exposure (f11 1/500 with HP5 rated at 320) and fixed the rangefinder to infinity. Click. When you see a true photograph, act decisively—no regrets. I wish I this clever in other areas. Tracking the Light Post Every Day. Self-portrait using the rear view mirror. Here I am with the Leica IIIA. New England Central freight 611 is along side the car near Brattleboro, Vermont. Conrail SD50s Move Tonnage on the Water Level Route. On April 9, 1988, I exposed this view on Conrail’s heavily used former New York Central System ‘Water Level Route’ west of Silver Creek, New York. Clear skies and bright afternoon sun were ideal when exposing Kodachrome 25. For this image of Conrail SD50s working westbound I used my Leica M2 fitted with an f2.8 90mm Elmarit. Using a telephoto with a Leica rangefinder was always a bit tricky. Although a window in the M2’s viewfinder provided a pretty good sense for the limits of the frame offered by the 90mm lens, the camera didn’t offer any sense of the effects of visual compression or limited depth of field that are inherent to this focal length in the 35mm format. Yet, the combination of Leica glass and Kodachrome 25 allowed me to make some exceptionally sharp images. I scanned this original Kodachrome slide at high resolution (4000 dpi) using a Nikon Super Coolscan5000 operated with VueScan software. For presentation here, I used Lightroom to scale the scanned file (which was more than 110 MB) into a Jpg. I left the corners of the slide mount in the frame to show that it hasn’t been cropped. It was dull mid-August day at Worcester, Massachusetts. I had my Leica 3A loaded with Ilford Pan F (ISO 50) and made a few exposures. This hasn’t been my usual film choice. More typically, when working in black & white, I’d use Ilford HP5 or Fuji Acros 100. I’ve found that difficult light can be a better measure of materials than clear bright morning. And flat summer light is about as difficult as it gets. For this trial, I processed the film using a Jobo with Ilford Ilfosol 3 developer. This was a crap shoot, as I’d only used this film/developer combination once before. Exposed using a Leica 3A fitted with a Nikkor 35mm lens. I opted for a 1:9 dilution, but scaled back my process time from the recommended amount to just 3 minutes 45 seconds. As is often the situation, I intentionally over-expose my black & white film and then under-process to obtain a greater range of tonality. Once processed my negatives looked pretty good, but these still required a bit of contrast control using Lightroom. While my end results look ok, I’ll need to refine my chemical process for Ilford Pan F (ISO 50) if I expect this film to perform as well as Fuji Acros 100. Also, I was hoping that the Pan F would approach the results I used to get with Kodak Panatomic X (ISO 32) back in the 1980s, but so far I’ve not achieved that goal. Long Hood at the Old Station; Baraboo, Wisconsin in Black & White—July 2016. 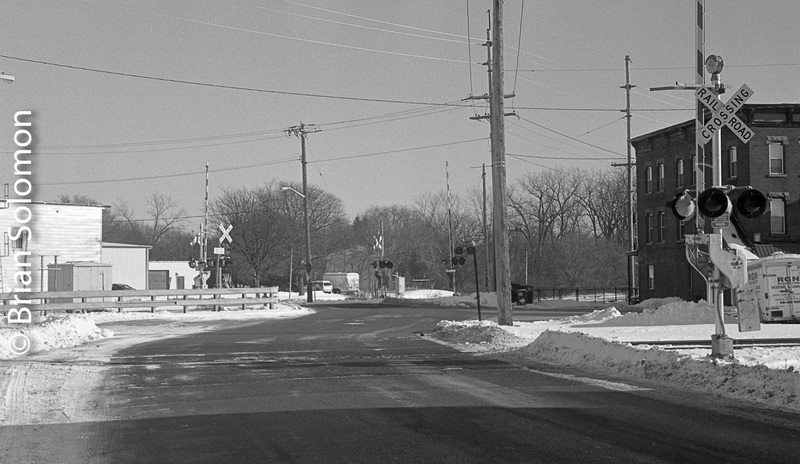 I exposed these three photos last week on Wisconsin & Southern at Baraboo, Wisconsin using my old Leica 3A loaded with Ilford Pan F black & white film (ISO 50). In its heyday, Baraboo was a division point on Chicago & North Western’s Chicago-Madison-Twin Cities main line. Its glory days are now more than a century past; decline began in the early twentieth century, when this route was augmented by C&NW’s low-grade Adams Line (via Milwaukee), which became a preferred route for through freight and fast passenger expresses. It was severed as a through line in the 1980s. As mentioned in an earlier post, on this July 2016 day John Gruber and I were following Wisconsin & Southern’s Madison to Reedsburg freight. Photo 1. In this view the harsh overhead light characteristic of ‘high sun’ was briefly soften by a passing fair weather cloud. Some photographers might cringe at the thought of a cloud, but here if offered opportunity for a variation on the scene. I adjusted the contrast of the image in post processing. Photo 2. Bright sun again; so with this photograph I used my rangefinder to focus on the trackside weeds instead of Wisconsin & Southern 4008. Photo 3. John Gruber looks on while Wisconsin & Southern 4008 switches at Baraboo. Exposed on Ilford Pan F using a Leica 3A rangefinder camera fitted with a Nikkor f3.5 35mm lens. In one, I’ve adjusted the contrast to compensate for a cloud that momentarily softened the noonday sunlight. In the second, I’ve worked with depth of field and focused on trackside weeds instead of the locomotive. In the last, I’ve included fellow photographer John Gruber to add in a human element. Great Combination—Bad Advice; Conrail May 1984. In my early days photographing every so often I’d hit upon a great film-camera-lens combination. You know, just the right set up to make memorable images. On May 6, 1984, my dad lent me his Leica M3 with 50, 90 and 135mm lenses. For reasons I’ve long forgotten, I loaded this with Plus-X (ISO 125) rather than Ilford HP5 or Tri-X (my typical films choices back then). More significantly, I decided to use an orange filter to alter the tonality of the film. I went trackside along the Conrail’s former Boston & Albany and exposed a series of evocative images of trains rolling through the Quaboag Valley. Conrail’s SEPW (Selkirk to Providence & Worcester) roars east through the Quaboag Valley east of Palmer on May 6, 1984. The magic combination: filtered Spring light; Plus-X film exposed using a Leica M3 with 90mm Elmar fitted with an orange filter. Processed in Microdol-X. These photos were much more effective than what I typically achieved with my Leica 3A and 50mm Summitar. I’d made a leap forward. At the time, I was delighted with the results and on a Friday night brought a stack of 3x5in. prints down to Tucker’s Hobbies (owned an operated by my friend Bob Buck). Friday evenings were our normal time to convene. And, one of Bob Buck’s patrons, a friend and a well-meaning (published) enthusiast photographer (who is long since deceased and so shall remain anonymous) offered me some free photo criticism.. I heeded this bad advice and returned to my older set up. Nearly two years passed before I made another serious foray into the realm of the telephoto for railroad photos. I didn’t know any better and my magic combination was unraveled before I had time to fully explore it. These are some roster views of equipment I’ve used over the years. I say ‘roster’ to clarify, that these are not ‘builders’ photos of the equipment. Like decades old General Motors diesels, my cameras are battle-worn machines that show the effects from years of hard service. While I’ve lit these images to show detail, I’ve not made any effort to disguise, clean or dress up these old cameras. You see them as they are. In my youth I made most of my photos with various Leica 3s that were the better part of fifty years old at the time. In the 1990s, my pal TSH exclaimed sarcastically that I’d missed my calling as a Nikon endurance tester. I’ve typically chosen to work with durable equipment that featured excellent optics and rarely worried about acquiring the latest models or gadgetry. These are tools to an end and not jewelry. One of several Leica model 3s that I used extensively in the 1970s and 1980s. This one is fitted with a 21mm Super Angulon, the aftermarket viewfinder for same is mounted atop the camera. The camera body is nearly 80 years old. It still works, I exposed several rolls of black & white film with it in June 2016. One of four Rolleiflex Model T twin-lens rangefinders that I’ve exposed photos with over the years. My dad’s first Rollei had gray leather. I wore that camera out in the late 1980s. This is one of the replacements. Between 2001 and 2007, I exposed hundreds of rolls of film with this Contax G2 rangefinder. It’s a solid and heavy little camera; seen here with a 45mm Zeiss Planar lens. Here’s my first digital camera, a Panasonic Lumix DMC-LX3. I bought it on the recommendation of Eric Rosenthal, who lent me one to test. I made my first photos with it in October 2009. After more than 65,000 exposures it developed a fault and I replaced it with a Lumix LX7 (with which I made this image). Over all, I like the LX7 better, but I wonder if it will prove as durable as this olds LX3? This Canon EOS 7D has served me well since 2010. It is seen here with a prime 200mm lens. These days I only use it occasionally, but it still works as well as the day I took it out of the box. Among the cameras missing from this selection of photos are several of my work-horse machines; my dad’s original Rolleiflex, my old Leica M2 rangefinder (that my brother occasionally still uses), various Nikon model F2/F3/F3T and N90s bodies (plus lenses) that I dragged all around the world between 1990-2006, a Nikkormat FT3 (with red leather), and my Canon EOS-3s, which I continued to carry around to exposed film. Also, my two newest machines, a Lumix LX7 (that exposed these images) and a FujiFilm X-T1 digital camera). Pan Am Southern; retro photos of a retro railroad; old tech in 2016. Let’s gaze back in time; 30 plus years ago I was a young enthusiastic photographer with a 35mm Leica rangefinder. I was fascinated by the Boston & Maine, operated by Guilford Transportation Industries (as Pan Am Railways was then known). B&M’s quaint operations, traditional signals, and antique General Motors diesels had a real appeal. Back then I focused on catching the EMD GP7s, GP9s, and GP18s, plus EMD switchers and run-through Delaware & Hudson Alco C-420s and C-424s. I made hundreds of images trackside in those days. On June 4, 2016, I picked up my old Leica, as I do from time to time, and loaded it with Ilford HP5 (often my choice film back in the day) and headed for Pan Am Railway’s East Deerfield yard before dawn, (as I have since I learned to drive 33 years ago). Antiques still run the rails on Pan Am. Pan Am Railways’ SD40-2s at East Deerfield Yard on the morning of June 4, 2016. A real rare pair in 2016; back to back high-hood GP40s. How sweet is that? This is Pan Am’s EDRJ (East Deerfield to Rotterdam Junction). As the EDRJ was getting its train together the morning fog began to burn off. Cosmic light. My lens of choice has a long history. In the 1970s and very early 1980s, I’d often photograph with a Nikon 35mm wide angle made with a Leica screw-mount. This lens had gone missing for decades and only recently re-emerged. In the interval it had seized up (as old equipment does when the lubrication dries out). My dad sent it for servicing and its now back in our arsenal of working photographic equipment. Good lenses are relatively common these days. Most off the shelf digital cameras have pretty good optics compared with many consumer-grade film cameras of yesteryear. But, truly great lenses remain hard to find. This Nikon 35mm is a great lens. Not only is it sharp, lightweight and compact, but it has a distinctive optical quality that is rarely found with modern lenses. In short it has ‘that look.’ (look at the photos). Pan Am’s EDRJ roars upgrade through Shelburne Falls, Massachusetts passing an old Boston PCC streetcar that resides at the Trolley Museum. I used to ride these cars on the Riverside Line in the early 1970s. After exposing my film, I processed it with the aid of a Jobo film processor to my own custom formula. Basically, I used a twin bath developer of Kodak HC110 with constant agitation at 71 degrees F for 4 minutes, 15 seconds. Stopbath for 30 seconds; twin bath fixer; rinse; permawash; and final wash. Negs were scanned as TIF files using an Epson V600 flatbed scanner at 3200 dpi . Nominal contrast adjustment was necessary with Lightroom. With a roar of 645 diesels and a cosmic cloud of exhaust, EDRJ approaches the east portal of the famed Hoosac Tunnel on the morning of June 4, 2016. The trees are taller at Eagle Bridge, but this station looks today much as it has looked for at least three decades. I’ve feature this in my book; Railway Depots, Stations and Terminals. Eagle Bridge, New York, the old Boston & Maine station is a relic of former times. Railroading gone retro! Hooray! Ilford HP5; f8 1/200th of a second. Tracking the Light has new material every day. 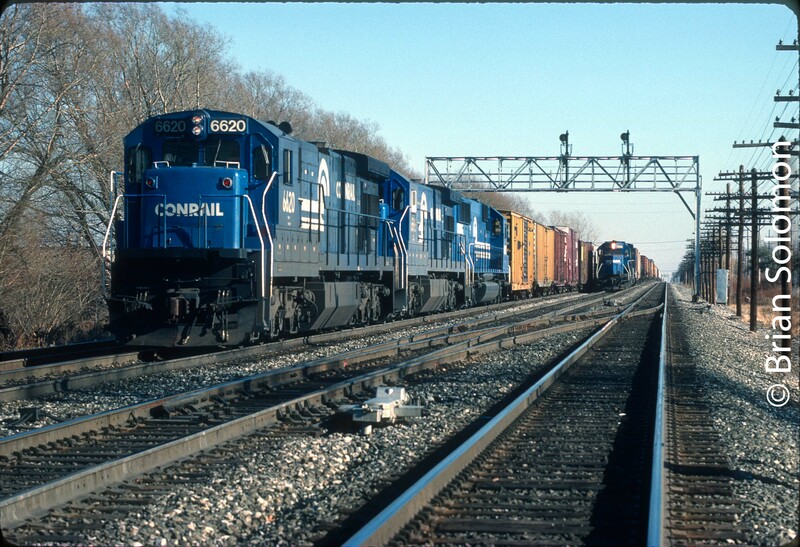 Moment in Time: Conrail at Bergen, New York, May 6, 1989. A westward van train raced along the Water Level Route, its horn sounding for the North Lake Street Crossing—the blaring Doppler effect announced its passage. For a moment it captured everyone’s attention. 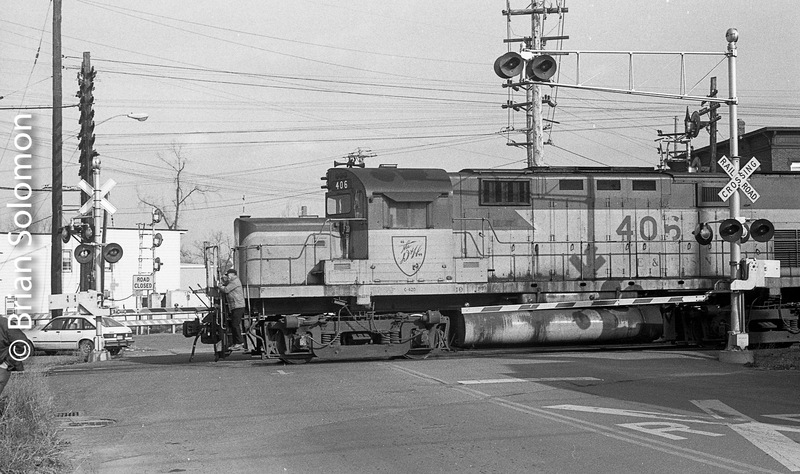 CLICK: I exposed this frame of 35mm black & white film at the decisive moment when the lead GP40-2 was visible on the crossing. A fallen bicycle on the sidewalk, turned heads, and the hint of motion blur of the train tells a story. Exposed on Kodak Plus-X with a Leica M3 with 50mm Summicron lens; processed in D-76 1:1 (with water), scanned using an Epson Perfection V600 Photo flatbed. Twenty six years passed before this image saw the light of day (or that from a back-lit computer screen). I’d processed the film at the Rochester Institute of Technology and sleeved the unprinted negatives. Recently, I scanned this roll of Plus-X and found on it this photograph. Brooks Avenue Yard, September 23, 1987. Among my favorite locomotives are Electro-Motive’s classic end-cab switchers, of the sort introduced in the mid-1930s with EMC model SC. I became familiar with this type as a result of an O-Gauge Lionel NW-2 dressed for Santa Fe that my father bought for me about 1972. Later, I watched and photographed full scale switchers on Penn-Central, Conrail and Boston & Maine. This type in effect emulated the shape of the common steam locomotive, allowing the engineer to look down the length of the hood, instead of a boiler. Electro-Motive wasn’t first to use this arrangement, which Alco introduced in the early 1930s. But, it was the Electro-Motive switcher that I found to have a classic sound and shape. Incidentally, I published this image on page 53 of The American Diesel Locomotive (MBI Publishing, 2000). When I was studying at the Rochester Institute of Technology in the late 1980s, Rochester & Southern’s Brooks Avenue Yard was just a few minutes away. I routinely stopped by the yard to see what was going on. At that time, R&S 107—a former Southern Pacific SW1200—could be routinely found drilling cars. Over the years, I made a number of images of this old goat. I left Rochester in 1989. I wonder what has become of this switcher? Does it still sport the SP-order oscillating lights? Explore Tracking the Light’s archives for more than 300 previous posts. Pioneer Valley Railroad at Westfield, Massachusetts, October 1984. Among Pioneer Valley’s early locomotives was Alco S-2 switcher number 106 which came to the line from sister Pinsly road Frankfort & Cincinnati. On October 12, 1984 it stands at Westfield, Massachusetts engine house ready for its trip to Holyoke and back. I exposed this view of Pioneer Valley Railroad’s Alco S-2 switcher with my old Leica 3A on black & white film on October 12, 1984. On the same day, I’d arranged with the railroad to ride this locomotive to Holyoke and back. It was a memorable trip. In Holyoke we worked the Graham branch that followed the banks of old canals. Several times we had to stop to open and close gates across the line. I featured this photo in my recent book North American Locomotives that features railroad by railroad locomotive profiles of many different lines. In addition to the Class 1 carriers, I also profiled a variety of smaller lines, many of which are my personal favorites. Quiet Day at Palmer Yard, 1979. 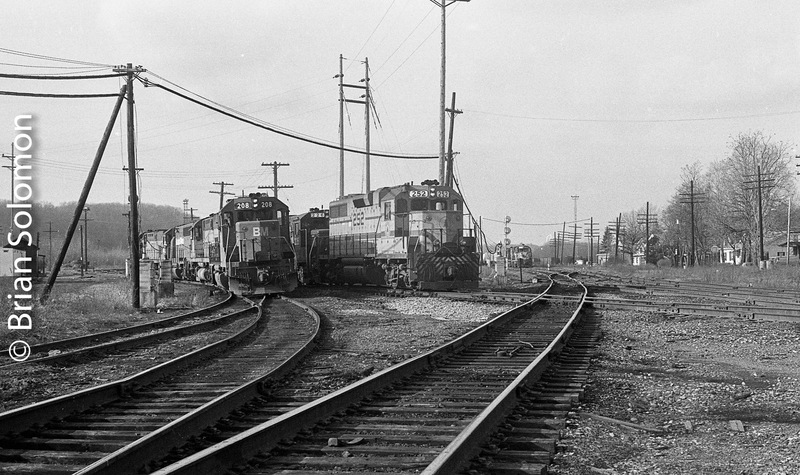 Looking south at Central Vermont’s Palmer, Massachusetts Yard in spring 1979. The Rocket was loaded circus style using a ramp in the yard. RS-11s were typically assigned to this train. In spring 1979, my dad and I visited Central Vermont’s Palmer, Massachusetts yard. At the time Palmer activity tended to be nocturnal. A lone RS-11 for The Rocket (Palmer-St Albans, Vermont piggyback) was the only locomotive in town. I made a few exposures on Kodachrome 64 with my Leica 3A. At the time I was in 7th grade at Monson Junior-Senior High School. Admittedly my photographic skills were rudimentary. The photos are passable, but a decent record of the scene. I wish I’d made more photos of CV’s piggyback trains. By the time I understood what it was about, it had stopped running. I have a few images of The Rocket on the road, but not very many. Detail view of CV RS-11 3611 at Palmer in spring 1979. RS-11s were among my favorite diesels and I’d see them regularly at Palmer. Electro-Motive Switcher in Holyoke, Massachusetts August 1987. Capturing an Engine in its Environment. Enthusiasm counts for a lot. I had just recently purchased a second-hand Leica M2 with 50mm Summicron, and I was seeing photos everywhere I looked. I often poked around Holyoke, where the mix of 19th century mill buildings and decaying railroad infrastructure offered endless possibilities for photography. Springfield Terminal 1401 switches a carload of scrap metal at the north-end of Holyoke Yard on August 20, 1987. Exposed on Professional Kodachrome 25 (PKM) using a Leica M2 with 50mm Summicron. At that time, Guilford Transportation Industries was the big show in town. 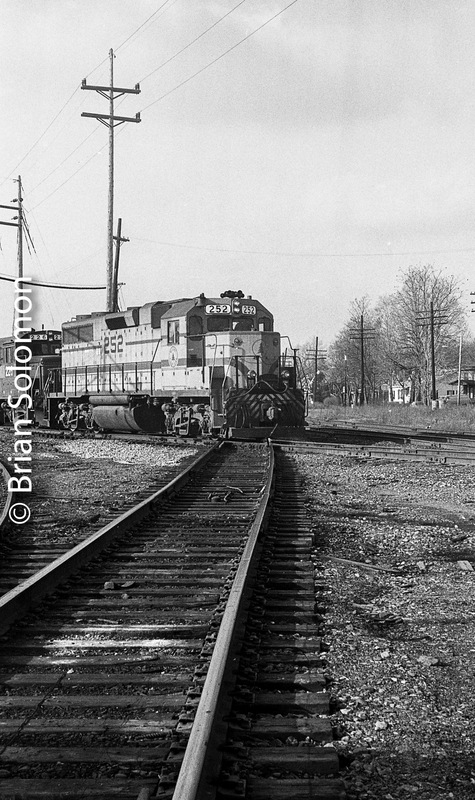 In addition to several through freights and a local, a switcher was often on duty drilling the Boston & Maine yard. On August 20, 1987, I found this former Boston & Maine SW1, recently repainted and renumbered as Springfield Terminal 1401. I exposed this image from the street, across from the old passenger station. For me it captures the feel of Holyoke at the time. New EMD F40PH-2C with Classic Semaphore. In the late 1980s only a few active semaphores remained in New England. One of the best places to see them was at the crossing of former New Haven Railroad lines in Walpole, Massachusetts. MBTA F40PH-2C crosses the diamond at Walpole. In 1988 this was still protected by New Haven-era semaphores. Exposed on Koadchrome 25 film using a Leica M@ and 35mm Summicron lens. I made this photo of a new Massachusetts Bay Transportation Authority F40PH-2 leading an outward train on the Franklin Line on the afternoon of March 2, 1988. The attraction for me was the contrast between the new locomotive and the ancient signal. A variation of this image appeared in TRAINS Magazine some years ago. I exposed it on Kodachrome 25 using my Leica M2 with a f2.0 35mm Summicron.The combination of clear New England light, Leica optics, and K25 film enhanced the scene. My Rare Photo of a CV Switcher. Central Vermont SW1200 1510 works the Tampax Factory spur at Bridge Street in Three Rivers, Massachusetts back in May 1984. Exposed on Ektachrome 200 with a Leica 3A and 50mm Summitar lens. Scan modified in post processing to improve contrast and exposure and minimize dust spots. The other day, I was showing Tim Doherty some photo locations around Three Rivers, Massachusetts. I described to him how the railroad once had a spur into the old Tampax factory. 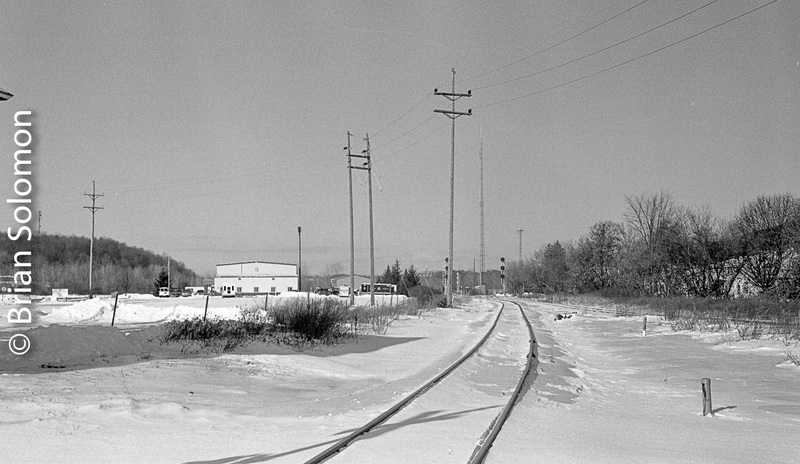 The spur (siding) had a switch off the mainline near the station (demolished many years ago), then crossed Main Street and made a sharp curve behind the liquor store before crossing Bridge Street. There’s still vestiges of this track today. Back in 1984, Dan Howard was visiting from Needham and he and I drove around the Palmer area making railway photos (as you do). The prize of the day, was this photo of CV’s SW1200 1510 working the Tampax factory spur on the Bridge Street Crossing. This photo was exposed on Kodak Ektachrome 200 slide film with my Leica 3A using my 50mm Summitar lens. It was a sultry dull day, and not the best for photography. While this is not a world class image, it captures a scene never to be repeated. I made this image during my senior year of high school. I don’t remember the specific circumstances, but on that day I’d followed Central Vermont Railway’s southward freight from Palmer to Stafford. I made photos of it south of downtown Monson off Route 32, and at the Massachusetts-Connecticut State Line. Shortly before the train came into view a cloud conveniently softened the sun. Central Vermont GP9s ease toward a grade crossing at Stafford Springs, Connecticut. With a carefully composed vertical in my rangefinder’s view, I released my Leica’s shutter with an audible snap. Many years later I scanned the negative. This view in downtown Stafford Springs has always intrigued me. The railroad runs tight to a row of buildings along the main street in town. Today, the brick building featured in the photograph hosts a trendy coffee shop where I sometimes meet my friend Roger Ingraham to wait for trains to pass and discuss photography. In 2013, New England Central operates the railroad, but the scene hasn’t changed all that much. I still make photos here from time to time. I exposed this image with my old Leica 3A and 50mm Summitar lens, and used a Weston Master 3 light meter to assist in exposure calculation. I processed the film myself in Microdol-X. Typically, I used a weak formula to save money. By doing so, I inadvertently avoided over developing my negatives (which was a flawed inclination of mine at the time). I made a few minor contrast modifications in post processing and cleaned up a few small spots and scratches on this nearly 30 year-old 35mm negative. Foggy Night in Palmer 28 Years Ago . . .
Palmer Union Station in the foggy gloom of a May 1985 evening. Exposed with a Leica 3A rangefinder on black & white film. Yesterday (July 10, 2013), I posted night photos I made in Palmer on June 28, 2013. I mentioned that my night photography efforts were part of a long standing tradition. So I dug up this image of the Palmer station exposed nearly three decades earlier. This was undoubtedly made on a Friday evening. A thick fog from the Quaboag River had enveloped the valley. In the station parking lot, and out of sight, Bob Buck is holding court. That night I made several views of the Palmer station in silhouette. All were exposed with my old Leica 3A and a 50mm lens, probably a Canon screwmount which I favored at the time. I was using my father’s Linhof tripod to support the camera. Exposure was calculated strictly from experience, and was probably about 30 seconds at f2.8. Interestingly, just the other day (July 9, 2013) I had the opportunity to interview Jim Shaughnessy about the night photography techniques he used to capture steam locomotives on film back in the 1950s. While similar to mine, his approach was very different and he perfected it more than three decades before my image was exposed. Where I used 35mm film and strictly ambient light for this image, Jim tended to use a 4×5 camera and a skilled combination of ambient and artificial flash. Of course, I was well acquainted with Jim’s work by the time I made this photo. There has been a copy of Donald Duke’s 1961 book Night Train on our shelf for as long as I can remember! This features Jim’s work among that of other well-established practitioners of the art of railway night photography. Amtrak’s Bascule drawbridge over the Hutchinson River in December 1982. Leica 3A with 50mm Summitar Lens. Between 1973 and 1985, my paternal grandparents lived at Co-op City in The Bronx, New York City. They had a great view of Amtrak’s former New Haven Railroad line from New Rochelle to the Hell Gate Bridge, which carried all of Amtrak’s Boston-New York trains. Until about 1980, this route also hosted infrequent freights. When I was younger, I’d keenly watch for trains from my grandparents 19th floor terrace, all the while hoping to see Amtrak’s aged former Pennsylvania GG1 electrics. By 1982, all of Amtrak’s GG1s had been retired. I made this morning view of a Penn-Station bound Amtrak train approaching the bascule drawbridge over the Hutchinson River led by an AEM7 electric. The scene itself wasn’t remarkable at the time, but I’m glad I made the effort to put it on film. It fascinates me now and brings me back to another time. Although details, such as how to effectively work with backlighting eluded me, I managed to get my exposure pretty close anyway. I was 16 at the time. I used my Leica 3A with f2.0 50mm Summitar—the camera I carried with me everywhere. A couple of years ago, I located some of my long-lost early negatives and made a project of scanning them. The miracle of modern scanning technology coupled with post-processing allowed me to finally make something of photos I’d made before I was technically competent to make decent prints. “I figured I’d improve my program, so I added an exponent. When I ran the program the next time, the screen filled with ‘Brian Likes Trains’ faster and faster, soon the whole screen was rolling. Then it suddenly stopped. Actually the whole computer stopped. All the computers in the room stopped! “A graduate student came in and spoke to my dad. Then my dad gave me a dollar and told me to go ride the subway or something. So I rode around and came back when it was time to drive back to Monson. Writing that program was like magic. Every time after that, my dad would give me a dollar and I’d ride around with my camera taking pictures. “By August, I’d been on all the subway lines. So I went to the railroad station. South Station is a great place, it’s where they keep all the Budd Cars. Those are great because the engineers who run them let you ride up front and don’t charge you to ride. This is South Station, that’s where you can see the Budd Cars. “The Budd cars go all over the place, but if you’re not careful you might not get back by the time to go home, so it’s really important to get a schedule. “My dad sometimes gave me his ‘SUPER WIDE ANGLE lens’. This is much better than my ‘Normal’ lens because its comes with a viewfinder which is an extra part you put on top of the camera that helps you to see pictures. With my normal lens, you have to look through a little hole, and that makes it harder to find good pictures. “He also gave me a light meter to measure the light and set the camera. I made lots of pictures. This is one of my favorite because it shows the Budd Cars and the old signals at South Station. I had to walk all the way from the subway stop to the parking lot to make this picture and it was really hot outside. In1982, I was visiting my friend Dan Howard in Needham, Massachusetts. We’d made a day of riding bicycles to Framingham and back to photograph trains. (Neither of us were old enough to hold a valid driving license). I was using a 1930s-era Leica 3A with an f2.0 Summitar lens. This didn’t have the crutches provided with most cameras today: no auto focus, no auto exposure, no zoom-lens, and no instant response digital display window. Simply getting film in the camera required the aid of a Swiss Army knife. While focusing the Leica using the rangefinder was a bit abstract. To gauge exposure, I used at Weston Master III light meter. With this camera I exposed Kodachome slides, and black & white 35mm film that I processed in the kitchen sink. Exposed with a Leica 3A with 50mm Summitar lens on Kodak black & white negative film; scanned with an Epson V600, and processed digitally using PhotoShop (to enhance contrast, and remove blemishes. To simply get a photo of any kind, I had base level camera-operating skills, but no sense for how to make real railroad photos. I didn’t appreciate conventional angles, nor did I know what to crop out or what to feature. I knew precious little about working with light or how to make optimum use of the film media. My chemical processing skills were rudimentary, at best. I just really wanted to make railway pictures! And, honestly, it’s a miracle that I got any results at all. Thankfully on that day, Dan & I met a friendly and helpful grade crossing gate keeper, who manually worked the gates where former Boston & Albany and New Haven Railroad lines crossed the main street. He chatted with us and shared knowledge about when trains were coming. (Incidentally, I made a color slide or two of him working the gates, which seemed like the thing to do). Toward the end of the day, a Conrail local departed Framingham’s North Yard, heading across the street and over the diamonds with the B&A on its way toward the Attleboro and beyond. I made this image ‘against the light’ looking into the setting sun, with a GP15-1 leading the local (which is about to cross the street) and some MBTA Budd cars in front of the old station. Sometimes raw and unchecked enthusiasm produces a more interesting image than one crafted by skill, but hampered by ambivalence (or over thinking the photographic process.) Modern photographic scanners allow for me to interpret what I captured more than 30 years ago on film, and compensate for my lack of technical skill. An Amtrak Turbotrain works along the east shore of the Hudson River approaching the Breakneck Ridge tunnels at Cold Spring, New York on August 1989. The historic Bannerman Castle makes for a Rhein-like prop in the distance. I made this view from a hiking trail on Breakneck Ridge along the Hudson River in August 1989. At the time my standard camera was a Leica M2 that I tended to use with Kodachrome 25. Turbotrains were standard equipment on Amtrak’s Empire Corridor trains making for common sights along the Hudson. While common on this route, Amtrak’s Turbotrains were an anomaly in American operating practice, making them an unusual and worthy subject for photography. These reminded me of the original streamlined trains of the 1930s such as Burlington’s Zephyrs, Illinois Central’s Green Diamond, and New Haven Railroad’s Comet. Today I’m happy to have a nice selection of these trains at work, but I regret not having traveled on them. I was always puzzled when my fellow photographers opted not to make photos of them. Perhaps Turbotrains seemed too common? Boston & Maine Slug Set at Rices, near Charlemont, Massachusetts; June 26, 1986. Yesterday, April 13, 2013, Pan Am Railways hosted a passenger excursion over the historic Boston & Maine route from Boston to Mechanicville. My father, Richard Jay Solomon, was among the passengers, and he sent me regular updates on his progress. This inspired me to revisit images such as this one. Exposed on Kodachrome using a Leica 3A fitted with a 65mm Elmar and Visoflex. Scouring the archives, I found this Kodachrome slide from the 1980s. It shows Guilford’s Boston & Maine mainline at Rices, near Charlemont, Massachusetts at 11:05 am on June 26, 1986. A westward freight led by B&M’s lone GP40-2 slug set (on left) is holding at the signals for an eastward train coming from Mechanicville, New York. This image was never among my best photographs. At the time, I was using my old Leica 3A fitted with a 65mm Elmar using a Visoflex reflex arrangement. To gauge exposure, I used an antique hand-held General Electric photo cell. The camera arrangement allowed for a sharp image but was awkward to use. More to the point, the meter wasn’t very accurate and my sense for exposure wasn’t highly tuned. As a result, this slide was overexposed, as were most of my efforts from the day. Thankfully, my choice of film at the time was Kodachrome 64, which was relatively tolerant of inaccurate exposure. So while, this slide appears too bright when projected on screen, the emulsion retained sufficient detail to be recovered digitally. I scanned the slide using my Epson V600 scanner, then corrected for my flawed exposure with Adobe Photoshop by manipulating the ‘Curves’ function. The end result isn’t objectionable. Exposed on Kodachrome using a Leica 3A fitted with a 65mm Elmar via a Visoflex. California Northern, Petaluma, California April 9, 1994.